This open concept floor plan was designed with total main floor living. Each room has its own privacy, but still remains easily accessible. One of our favorite spaces is the kitchen! The harmony of colors and finishes is subtle but memorable. A rich blend of gray, beige and gold Silestone quartz spans the perimeter while using a soft cream quartzite on the center island. To top off the space, a crackled subway tile backsplash, initially inspired by the vintage arabesque pattern, is featured behind the cooktop. Standing at the uniquely shaped center island, you have views of the covered deck and sunroom. Entering the sunroom you will walk under a large stone archway into a room filled with windows letting in plenty of natural light. The custom fireplace design in this room is elegantly appointed with fine craftsmanship and breathtaking detail. The Master Suite is equipped with a box vault ceiling and crown molding throughout the perimeter. A custom built-in was designed to be a median between the owner’s bathroom and expansive walk-in closet. The spa-like spacious bathroom, includes dual his-and-her vanities separated with a free standing tub that sits below corner windows. Adding more light to the space, we incorporated glass on the shower wall that allows a glimpse in to see the floor to ceiling Carrara marble tile detail in the large walk-in shower. Bringing in pristine elegance, we created an impressive powder bath that features a lovely damask pattern wallpaper, brushed gold finishes, thick crown molding and a furniture style vanity, topped off with a hand-made wrought iron vanity light. As you travel down the stairs to the finished basement, you will be greeted by a full open concept design with future wet bar capabilities. Two bedrooms are finished with a jack and jill bathroom connecting the two rooms. Another bathroom for guests was uniquely designed to be masculine and dramatic. With a cool design featuring porcelain tile with metallic flecks and an accent wall in the shower that features leather-looking tile, this bathroom is surely one of a kind! This basement even features a partially designed hockey room with caged lights! This home is only open to tour this month during Parade! Be sure to stop by and tour Thursdays – Sundays from 12-6pm or stop in during our two Saturday Events – [February 27th – Meet our Designer, Danielle Matthies] and [March 12th – Design Your New Home with Architect Steve Lemke]. 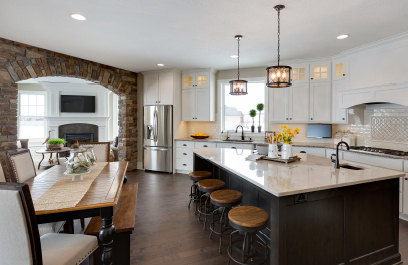 For more information on our homes, email info@homesbytradition.com or call 952-322-8700.